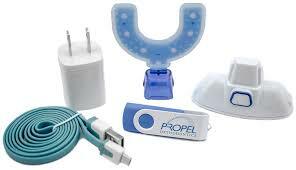 Propel VPRO5 Orthodontic Device – Clonmel Orthodontics Blog. Propel Orthodontics have released a device VPRO5 ™ to be used in combination with orthodontic treatment, it can be used with labial (outside braces) of the metal or ceramic type, or with inside braces (lingual braces ) for instance of the win™ or incognito™ or Harmony ™ type or with aligners including invisalign™ . This device is very similar to “Acceledent™ ” which has been discussed in a separate blog in this series. It is suggested that this device may accelerate orthodontic tooth movement (in a non-surgical way). 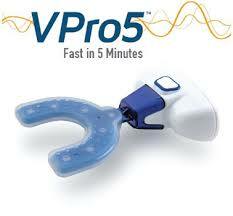 VPRO5 ™ emits high frequency vibrations , that it is suggested speed up tooth movement by 3 possible means. (a) Possibly through a beneficial effect on the bone biology. (b) By facilitating the sliding of teeth along the orthodontic wires. (c) By helping to seat orthodontic aligners . The VPRO5™ is expensive €800- €1000, until high quality research shows that VPO5™ to be effective , I feel that I cannot recommend it to my patients.